These two very different forms had once been considered separate species. 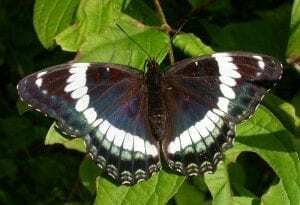 WHITE ADMIRAL: Upperside is black with broad white median bands on both wings; hindwing has a marginal row of blue dashes and a submarginal row of red dots. Underside is reddish-brown with white median bands as on the upperside. 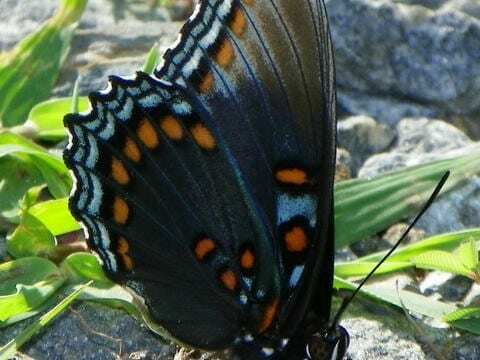 RED-SPOTTED PURPLE: Upperside is blue to blue-green with much iridescence on the outer part of the hindwing. 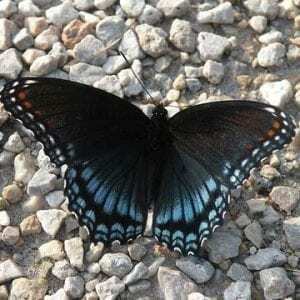 Underside is dark brown. Forewing has 2 red-orange bars near the base of the leading edge; hindwing has 3 red-orange spots near the base and a submarginal row of red-orange spots. The two forms hybr idize where their ranges overlap, creating various intermediate forms which may be found in or near the overlap zone.